Integrated with cutting edge technology, Asian Test Equipment presents Universal Testing Machine in front of the industries an economical testing solution. Our Universal Testing machine is capable of testing varied parameters like compression strength, tensile strength, elongation and shear strength of different materials. Universal Testing Machine is designed for testing materials and other materials under tension, compression bending, transverse and shear loads. Principal of Operation :Operation of the machines is by hydraulic transmission of load from the test specimen to a separately housed load indicator. The hydraulic system is ideal since it replaces transmission of load through levers and knife edges, which are prone to wear and damage due to shock on rupture of test pieces. Load is applied by a hydrostatically lubricated ram. Main cylinder pressure is transmitted to the cylinder of the pendulum dynamometer system housed in the control panel. The cylinder of the dynamometer is also of self-lubricating design. 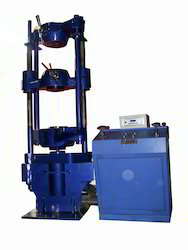 The load transmitted to the cylinder of the dynamometer is transferred through a lever system to a pendulum. Displacement of the pendulum actuates the rack and pinion mechanism which operates the load indicator pointer and the autographic recorder. The deflection of the pendulum represent the absolute load applied on the test specimen.Return movement of the pendulum is effectively damped to absorb energy in the event of sudden breakage of a specimen. We are one of the leading manufacturer, exporters & suppliers of high quality Universal Testing Machines. It Includes both Mechanical Universal Testing Machines. & Electrical Universal Testing Machines. 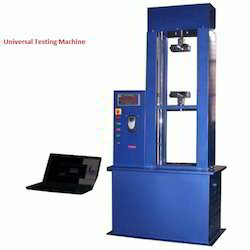 “Asian's” Universal testing machine provide a relatively inexpensive way for determining the Tensile, compression, shear strength and elongation of variety of raw materials such as rubber, leather, fabric, plastics, Belts, wires etc. Tensile, compression, shear strength and elongation are the prime characteristics of most of the raw materials, whether they are metals or non-metals, such as rubber, textiles, plastic, paper: or finished products such as rods, wires, ropes, yarns, belts etcetera. These properties very often play the major role in determining the suitability of any raw material for any specific application. It is therefore, of utmost importance to determine these characteristics accurately, conveniently, and quickly. Tensile Tester tackle the toughest tests with their superior axial alignment, stiffness, and crosshead guidance. A simple design allows for lower cost, faster delivery, and years of maintenance free operation. All eXpert systems are capable of performing compression tension, and flexure tests.